Yamaha R15 has officially entered the third generation through R15 Version 3.0 in India for INR 1.25 lakh. The updated price for the bike is INR 1.27 lakh (ex-showroom). The motorcycle is an update that buyers were expecting from a long time in India. Presently, Yamaha has listed 2 variants for R15 in India. The R15 V2 was discontinued recently. The R15S is priced at INR 1,16,746 and carrying the popular single, long seat for max pillion benefits. It is powered by the same 149.8cc, single cylinder engine producing 17 HP and 15 Nm of torque. The R15 Version 3.0 is powered by an advanced 155.1cc, VVA equipped engine producing 19.3 HP and 15 Nm. The engine comes mated to a 6-speed gearbox. The brand has reduced the V3's wheelbase by 20mm while seat height has gone up by 15mm. Yamaha is offering improved 170mm of ground clearance while overall weight saw an increase of 3kg with added technology. Yamaha R15 V3 revs to a maximum power range of 10,000 rpm while R15S is good for max power at just 8500 rpm. Click here to know more about Yamaha YZF-R15S. Click here to know more about Yamaha YZF-R15 Version 2.0. 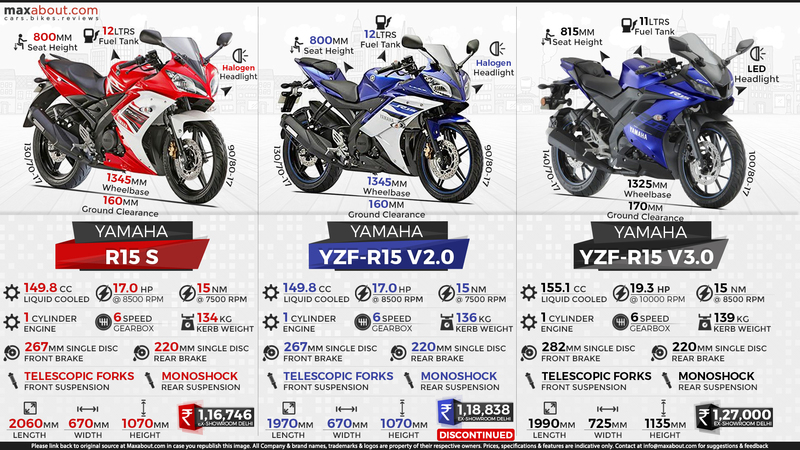 Click here to know more about Yamaha YZF-R15 Version 3.0. Downloaded 79 times this week.